The folks over at Elecite have been mad busy the past little while. In addition to pumping out some nice new themes they have been working behind the scenes on launching a fresh new site for everyone to make use of. 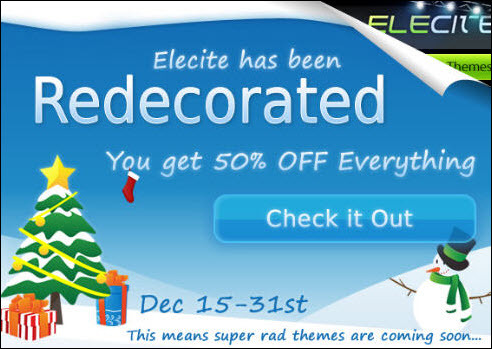 Elecite is back now in full force, new themes are on there way and to celebrate the relaunch as well as the holidays, Elecite is having a massive 50% off all themes sale. No coupon code needed, no fuss. Just great themes at a great price. Be sure to check out the full selection and screenshots folks.